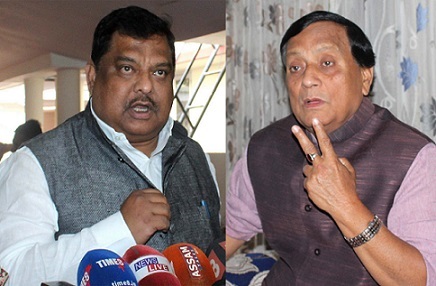 The high profile face-off between former Congress Minister Rakibul Hussain and his one-time compatriot Anil Raja reached the High Court in Guwahati on Saturday. Rakibul Husssain reached the court quite early on Saturday for the hearing of his defamation case against Anil Raja, former party man now expelled from the Congress. It may be recalled that Anil Raja had labeled serious allegations against Hussain for possessing assets disproportionate to his earnings. The former Forest Minister during Congress regime had filed a defamation case against Raja for allegedly making fabricated charges. Raja had also questioned the educational qualification of Hussain claiming that the former minister had acquired a forged certification testifying his graduation. However, Anil Raja was not present in the court on Saturday. His lawyer was present in the court representing him. When contacted, Raja told Northeast Now that he could not come owing to severe waist pain. It may be noted that Raja had given a miss to the earlier date of hearing citing high diabetes. Notably, it was Raja’s lawyer who had sought Saturday as the date of next date of hearing. Raja had appealed to the High Court to disqualify the defamation case filed against him by Hussain. However, the court had rejected his appeal and took up the case summoning him for hearing. Rakibul Hussain further said that Raja was seen attending series of meetings the day after he skipped the court hearing date. It may be recalled that Anil Raja had also written to the Election Commission of India challenging that Hussain had forged his educational qualification, demanding his disqualification as a legislator. After Hussain refuted the charge, an RTI filed by a well-wisher of the former minister obtained the required documents from the Gauhati University. Meanwhile, The High Court has fixed July 4 as the next date of hearing.